The Air Force ROTC program is divided into two courses of study (the General Military Course, and the Professional Officer Course) and a Field Training experience. The full program will take more than 480 hours over four years of college (including one summer for Field Training). Leadership development is emphasized throughout the program. 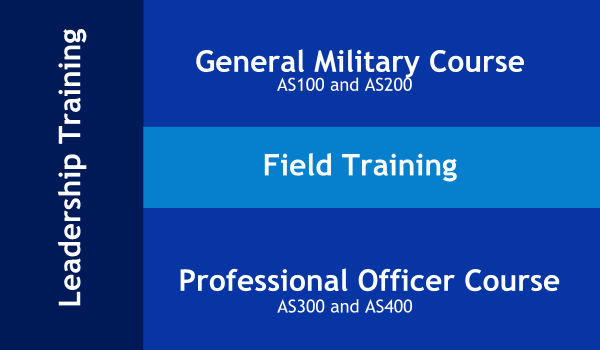 Additional, off site training opportunities are also available. The General Military course of study is for first-year and sophomore students. The Professional Officer course of study is for juniors and seniors. Note - It is possible to complete an accelerated version of the ROTC program if you did not begin as a first-year student. Contact the Cadre commander for more information @ 919-660-1869. During the summer after your sophomore year, you will participate in a 20-day field training experience. It is required for all cadets who wish to continue into the Professional Officer Course. This rigorous program involves physical conditioning, weapons training and survival training. Field training offers you the opportunity to develop your skills as both a leader and team member.